Summer is almost upon us, and with it comes the chance to spend more time outdoors enjoying the warm days and light evenings. It’s a great time to encourage your children to put down their smartphones and game controllers and get outside in the fresh air, which is one of the best things they can do for their health and wellbeing. There are all sorts of clubs, sports, enthusiast groups and support organizations offering a wealth of opportunities to get involved with outdoor pursuits, so however reluctant your kids are, there’s bound to be something they will enjoy. Here are just a few ideas. The use of bow and arrow goes back thousands of years and still has a tremendous attraction for both targets and hunting. The bows themselves have developed to become pretty high-tech pieces of equipment, but still, demand strength and skill to use well. If your child wants to have a go at archery, take them for some lessons at a reputable school. They’ll be able to try different kinds of bows under expert supervision, and learn how to use the bow accurately and safely. If they are keen, you could then look to purchase a youth compound bow for them with which to practice at home. Being able to hit a target is a real thrill and a great confidence boost. It’s also a sport that can be enjoyed by kids who aren’t particularly athletically inclined, so everyone is on a level playing field. Riding a well-mannered horse through the beautiful summer countryside is a relaxing and rewarding experience, and if your kids love animals, or fancy themselves as cowboys, riding the trails will be something they’ll really enjoy. If your kids have never ridden before, book them in for some lessons at a good riding center so they can learn how to handle the horse and become more confident. At many schools, there are opportunities for kids to get involved with caring for the horses and working around the stable yard, and kids love getting to know the animals. Riding is a good way of helping kids to get fit, even though it may not appear to be! You actually use a great many muscles in your body that you don’t normally work very hard, plus you need to be balanced and flexible to ride well. If the kids are working in the yard as well, they’ll be getting plenty of exercise. Ok, it’s not exactly a pirate treasure chest you’ll unearth, but geocaching still has all the fun of hunting for treasure and following clues to find the hidden caches. The treasure will be a notebook to record your finding of the cache, and little mementos left by other geocachers, so no pieces of eight or gold doubloons. However, by diverting the kids from the fact that they are essentially going for a long walk, you’ll find they are so focused on discovering the cache that they don’t notice all the good exercise they’re getting at the same time! If you haven’t come across geocaching before, you can find out more online about how it works and where to take part in your area. Perfect for peaceful days by the lake, where you can share the tranquillity with your children for many hours. 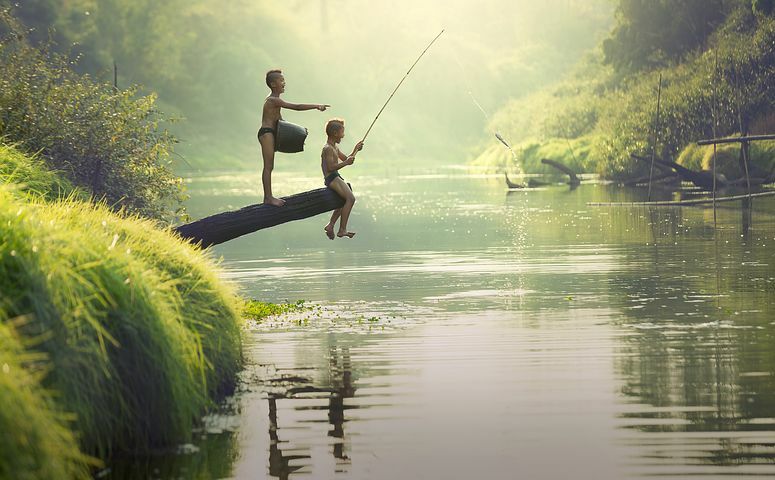 There are different kinds of fishing available in lakes, rivers, and in the sea, so you have options to try one or all of them and see which is the favorite. The most important thing to do before you begin is to find about the license requirements in your state. You will need a license to fish, and you’ll also need to be aware of how many fish you’re allowed to catch, what species are permissible, and how large the fish need to be. If you’ve never been fishing before, visit a lake where they offer introductory demonstrations and tuition to get you started. This is a great pastime for quiet contemplation and relaxation, but it can also become quite physical if you hook a large fish and have to reel it in. Depending what you’re fishing for, you could also come home with a nice fresh catch for supper! A lot of kids become very proficient at swimming in a pool, but don’t get out into nature to swim. In the summer and early autumn, when the water is warmer and the sun is shining, swimming in a lake or at the beach offers a completely different experience than the pool they are used to. Obviously, you need to be mindful of safety, so this is one for competent swimmers and to be undertaken in safe surroundings. It’s not just swimming itself, either, there are a whole host of sports that take place on or in the water, including surfing, snorkeling, scuba diving, water skiing, and windsurfing. For kids that love sports and are confident in the water, these are some exciting and highly rewarding activities. You can join in if you’re feeling brave, or just soak up the sun from the sidelines. For a change of pace from the excitement of water sports, nature watching is a fascinating and educational activity that can be carried out with very little requirement for expenditure or special equipment. For example, using a bug catcher to gather up a collection of insects from the plants or trees near where you live will give kids a fascinating insight into the little creatures sharing their world. Through using a good identification guide, they’ll be able to name each bug and find out about its lifecycle and keep records of what they’ve found. Birdwatching is a hobby that people become very passionate about and is an interest that can last a lifetime. It’s more of a challenge than catching bugs, as you have to sit and wait for the birds to appear, but the excitement of seeing a new bird is a wonderful experience. These are just a few ideas for some different things to do with your kids this summer. There’s no need to spend a lot, or for your kids to have any special abilities to enjoy many of these and other activities, so see what’s on in your area and get the kids out in the summer sun.